Hey, thanks for checking out our current promotions! To make booking a camp at Kerem even more rewarding our Team have compiled a list of great initiatives, discounts… and just plain awesome freebies. Book our activity combos and save, visit us for a Monday-Wednesday camp and we will send you off to Outback Splash for FREE… or get in quick and take advantage of our introductory teachers accommodation offers. Book a Monday to Wednesday Camp and receive FREE entry to Perth's Outback Splash! With brand new waterslides opening in late 2019, Outback Splash is a must visit in Summer... you don't even need a bus, Campers can walk direct from Kerem. 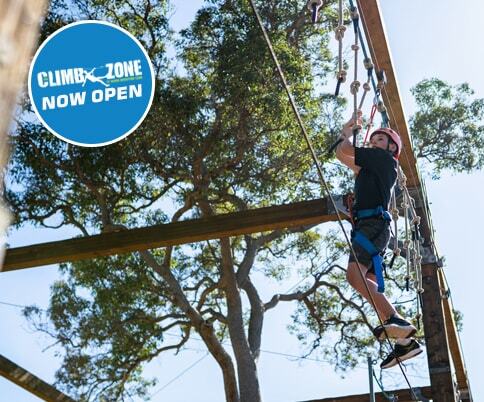 High Ropes, Low Ropes, Rock Climbing and the Web Crawler climbing tower; The Climb Zone at Kerem Adventure Camp delivers adventure for all ages, in a safe and family friendly environment. There are great combos and discounts available for Campers; ask our Kerem Team today. To treat our amazing Teachers, the Kerem Team offer discounted nightly rates depending on the size and length of your Camp. Enquire Today. Experience our NEW Rock Wall and Low Ropes Course. Book both the Rock Wall and Low Ropes activity for your camp and get both for just $30! Book a camp in Terms 2 or 3 and receive HALF PRICE entry to The Maze, home of Outback Splash!